In short, the Midrash is teaching us that the fiscal cost of the Tabernacle – as a public project funded by the taxes of the Israelites – must be entirely accounted for in an open, transparent, and accessible way. It’s also teaching us that Moses – as leader of the people – is answerable to the people. Even Moses, who speaks to God face-to-face in a way that no others do, must still face the people. In a broader sense, it speaks about the virtue of transparency among leaders and the need to be open and answerable to the public. Stephen Harper could learn a lot from Moses. An egregious lack of transparency and accountability related to the purchase of military aircraft is exactly what led the Conservatives to be censured for Contempt of Parliament this past week. Of course, anyone with their finger on the pulse of Canadian politics knows that this specific issue is part and parcel of a greater patten of behaviour on part of the Tories; one that paved the way to the landmark ruling by (famed non-partisan) Speaker of the House Peter Milliken. 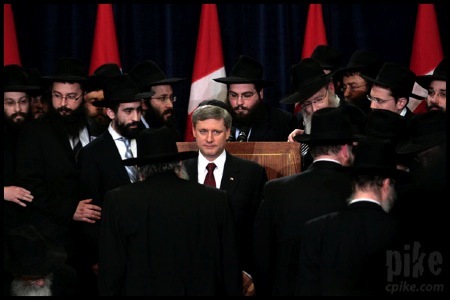 Certainly if we Jews acknowledge that Moses was expected to be held accountable to the people and to act transparently, we should bestow the same criteria upon Mr. Harper. Certainly if our Midrash teaches us the virtues of un-opaque leadership, we should value that in our national leader as well. It is challenging for me to view how Harper and the Conservatives can be painted as an honest, transparent, accountable, and open government. Sure, there have been individual instances when they acted reasonable on these grounds. But the story of the Tories – as any learned political observer will tell you – is one of secrecy, opacity, avoidance of responsibility, centralized power, and tight-lipped relations with the Canadian people. So to the Jews who will likely vote for the Conservatives on the grounds of their supposed dominance of the “support for Israel” (whatever that means) issue: if you value our rabbinic instructions as much as you value the Conservative’s platform (which, remember, didn’t exist when you voted last time…), perhaps you should reconsider the value of your vote. P.S. : Not convinced that the Tories have a national Jewish-vote buying strategy in place? It isn’t just happening in Thornhill, it’s also taking place down the 401 in Montreal’s Mount-Royal riding.